Pillows play such an important role in the sleeping experience, and choosing the “right” pillow is very personal. How you sleep—on your back, on your side, on your stomach, or all of the above, can influence what type of pillow feels best. Add to that a person’s overall preference for feel, whether it is flat, fluffy, firm or anything in between, finding that perfect pillow fit can take time. 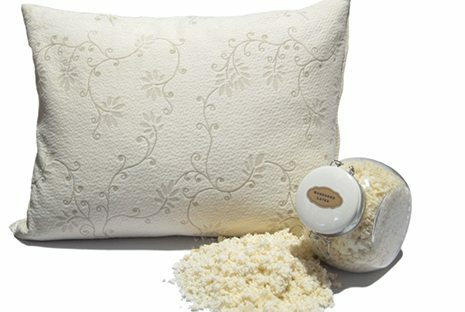 The Natural Sleep Store has a number of healthy, natural and organic pillows to choose from. Some of our favorite pillows are made by Suite Sleep, because of the quality of materials they use and because of their versatility. The Suite Sleep Shredded Rubber Pillow is part of their Suite Comfort Adjustable Pillow line. I think shredded rubber pillows are a great choice for multiple sleeping preferences because you can mold and shape the latex fill to support your head, neck and shoulders depending on how you sleep. Another great thing about the shredded rubber pillow is, unlike cotton and wool which can compress/flatten out over time, shredded rubber holds its loft. You’re not spending a lot of precious sleep time fluffing your pillow for support. The adjustable aspect of the Suite Sleep Shredded Rubber Pillow is one of its greatest selling points. The organic cotton sateen encasement has a zipper so you can open the pillow and take out some of the shred for a softer, more pliable pillow with a lower loft, or you can add more fill for a firmer pillow with a higher loft. The adjustable-fill aspect of this pillow is enough to make this an outstanding choice, but Suite Sleep also offers additional pillow covers for added comfort and protection. I mentioned the zippered, organic cotton sateen encasement which is the standard encasement for all of the pillows. The most popular choice among the optional encasements is the organic cotton knit encasement. The knit is stretchy and flexible. I love it because it adds a little extra protection for the pillow and it’s easy to remove and wash. The organic cotton knit also helps smooth out the feel of the shred inside the pillow. If you want a really plush feel to your pillow, choose the new quilted washable wool and organic cotton encasement. All of the options for personalization and customization in this pillow line make it hard to beat, and makes the Suite Sleep Shredded Rubber Pillow one of the most popular among our customers. Enter to win a Suite Sleep Shredded Rubber Pillow! No purchase necessary, $80 value. Giveaway ends May 31st, 2015. Congrats to James S. of Denver Colorado, you won this pillow!